Pet owners are urged to plan now to keep pets safe on New Year's Eve. Fireworks can be terrifying for pets, causing a great deal of fear and distress. We’re urging pet owners to plan ahead for the safety of their animals this New Year’s Eve. Over New Year’s Eve and New Year’s Day, hundreds of pets across Victoria flee their homes in fear caused by fireworks. Sadly, some of them become lost or injured after scaling fences, running long distances and in some cases, being hit by cars. If your pet has ever escaped during fireworks (or a thunderstorm) or shown signs of a phobia, make an appointment with your vet to discuss treatment. A variety of options are available, such as anti-anxiety medication, Adaptil (a pheromone product), or a Thundershirt, among others. It’s best to address this sooner rather than later, as it may take time for your pet to adapt to some of these treatments. Your vet will be able to recommend a suitable treatment option based on your pet’s individual needs. Be sure to update your details with the microchip registry if they change, for example, if you have moved house or changed your phone number. For more information about microchipping and pet identification, phone National Pet Register on 1300 734 738. It’s highly recommended that pets are brought indoors during fireworks. However, it’s important that your home and yard are safe and secure at all times. Make sure any gates and doors are properly closed. Check fencing for any holes, loose palings or gaps. Secure or remove any cords, cables, glassware or other objects around the home that may pose a safety hazard. Place your pet’s bed, mat or crate in a safe and secure part of the house. Close the blinds and play relaxation or classical music to muffle firework sounds. Offer your pet special treats and toys to distract them. Comfort and reassure your pet if needed. This won’t reward fear, but rather, may help reduce panic and distress. Be aware of weather warnings and contact your local council to find out about scheduled fireworks in your area. Remember that illegal backyard fireworks are unpredictable and can go off at any time, so it’s important that your home is always safe and secure. 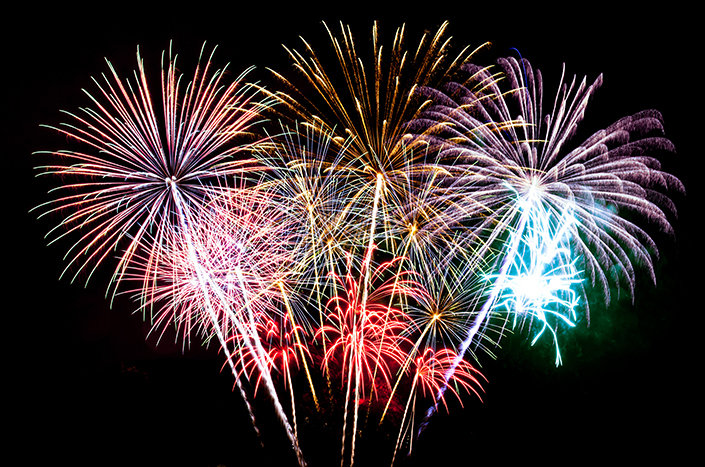 Click here to download our Fireworks, Storms and Your Pet fact sheet to refer to later. For advice specific to your pet, please speak with your vet without delay. You can make an appointment at the Frank Samways Veterinary Clinic by calling (03) 9329 2755. If you have lost or found a pet over the festive season, or need to make an appointment at our Clinic, be sure to check our Christmas and New Year opening hours before you visit us.